A profile of Changemovementng.org was found on the social network Facebook. 14 other websites are located on this web server. Most of them are provided in the english language. Only a few websites on this web server are x-rated. 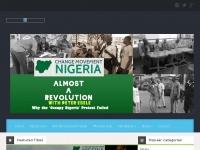 The websites of Changemovementng.org are served by a Apache server. The website does not specify details about the inclusion of its content in search engines. For this reason the content will be included by search engines.